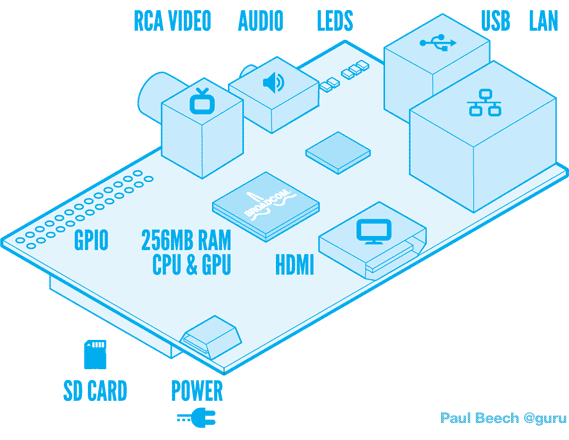 There are several small PC kits for people to have computing power in the palm of their hands. Many of these are actually, low powered devices usually loaded with Android or some kind of Linux distro, whose sole purpose of existing is to—well, we are still not sure about that one, but it certainly fills a size gap in between laptops and tablets. That said, not a single one of these ultra-micro-small PC kits compare in popularity to the infamous and nearly impossible to get Raspberry Pi. In fact, just yesterday we gave the device its own home here on XDA. The Raspberry Pi has gained so much steam over the last few months that it has brought together developers from across XDA to discover the secrets it holds. This is versatile, so much so that one of our favorite developers and hardware hacker extraordinaire, XDA Elite Recognized Developer AdamOutler, decided to try his hand at porting one of the most useful features found in Android devices—and succeeded! It seems that ADB (Android Debug Bridge) was a bit of an impossibility but not entirely unreal. Because of this, Adam tried for a few days to compile and port ADB over on the pie, but as with any work of this kind, bugs were coming in from all different directions. And that is where the beauty of this community kicked in as other devs with backgrounds different than Adam’s started showing up in the thread making suggestions and offering their help in other areas. Progress was still going until XDA Forum Member trevd made a post stating that he was able to get the port running. He went ahead to set up a github tree for everyone to take a quick peek at the work done and to try and get it running on other ARMv6 devices as well. Needless to say, please take this for a spin if you have a RPi and leave some feedback for the devs if it worked well.